This article is about the ancient city. For the modern city, see İzmir. This article is about the ancient city in Greece. For the ancient capital of the northern Kingdom of Israel, see Samaria (ancient city). For other uses, see Smyrna (disambiguation). 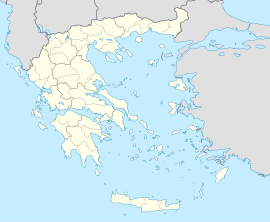 Smyrna (Ancient Greek: Σμύρνη, Smýrnē or Σμύρνα, Smýrna) was a Greek city dating back to antiquity located at a central and strategic point on the Aegean coast of Anatolia. Since 1930, the modern city located there has been known as İzmir, in Turkey, the Turkish rendering of the same name. Due to its advantageous port conditions, its ease of defense and its good inland connections, Smyrna rose to prominence. Two sites of the ancient city are today within the boundaries of İzmir. The first site, probably founded by indigenous peoples, rose to prominence during the Archaic Period as one of the principal ancient Greek settlements in western Anatolia. The second, whose foundation is associated with Alexander the Great, reached metropolitan proportions during the period of the Roman Empire. Most of the present-day remains of the ancient city date from the Roman era, the majority from after a 2nd-century AD earthquake. In practical terms, a distinction is often made between these. Old Smyrna was the initial settlement founded around the 11th century BC, first as an Aeolian settlement, and later taken over and developed during the Archaic Period by the Ionians. Smyrna proper was the new city which residents moved to as of the 4th century BC and whose foundation was inspired by Alexander the Great. Old Smyrna was located on a small peninsula connected to the mainland by a narrow isthmus at the northeastern corner of the inner Gulf of İzmir, at the edge of a fertile plain and at the foot of Mount Yamanlar. This Anatolian settlement commanded the gulf. Today, the archeological site, named Bayraklı Höyüğü, is approximately 700 metres (770 yd) inland, in the Tepekule neighbourhood of Bayraklı at 38°27′51″N 27°10′13″E﻿ / ﻿38.46417°N 27.17028°E﻿ / 38.46417; 27.17028. New Smyrna developed simultaneously on the slopes of the Mount Pagos (Kadifekale today) and alongside the coastal strait, immediately below where a small bay existed until the 18th century. The core of the late Hellenistic and early Roman Smyrna is preserved in the large area of İzmir Agora Open Air Museum at this site. Research is being pursued at the sites of both the old and the new cities. This has been conducted since 1997 for Old Smyrna and since 2002 for the Classical Period city, in collaboration between the İzmir Archaeology Museum and the Metropolitan Municipality of İzmir. For further information on etymology of the city's name, see İzmir#Names and etymology. Several explanations have been offered for its name. A Greek myth derived the name from an eponymous Amazon named "Σμύρνα" (Smyrna), which was also the name of a quarter of Ephesus. This is the basis of Myrina, a city of Aeolis. The name Smyrna may also have been taken from the ancient Greek word for myrrh, "smyrna", which was the chief export of the city in ancient times. The region was settled at least as of the beginning of the third millennium BC, or perhaps earlier, as the recent finds in Yeşilova Höyük suggests. It could have been a city of the autochthonous Leleges before the Greek colonists started to settle along the coast of Asia Minor as of the beginning of the first millennium BC. Throughout antiquity Smyrna was a leading city-state of Ionia, with influence over the Aegean shores and islands. Smyrna was also among the cities that claimed Homer as a resident. The early Aeolian Greek settlers of Lesbos and Cyme, expanding eastwards, occupied the valley of Smyrna. It was one of the confederacy of Aeolian city-states, marking the Aeolian frontier with the Ionian colonies. Strangers or refugees from the Ionian city of Colophon settled in the city. During an uprising in 688 BC, they took control of the city, making it the thirteenth of the Ionian city-states. Revised mythologies said it was a colony of Ephesus. In 688 BC, the Ionian boxer Onomastus of Smyrna won the prize at Olympia, but the coup was probably then a recent event. The Colophonian conquest is mentioned by Mimnermus (before 600 BC), who counts himself equally of Colophon and of Smyrna. The Aeolic form of the name was retained even in the Attic dialect, and the epithet "Aeolian Smyrna" remained current long after the conquest. Smyrna was located at the mouth of the small river Hermus and at the head of a deep arm of the sea (Smyrnaeus Sinus) that reached far inland. This enabled Greek trading ships to sail into the heart of Lydia, making the city part of an essential trade route between Anatolia and the Aegean. During the 7th century BC, Smyrna rose to power and splendor. One of the great trade routes which cross Anatolia descends the Hermus valley past Sardis, and then, diverging from the valley, passes south of Mount Sipylus and crosses a low pass into the little valley where Smyrna lies between the mountains and the sea. Miletus and later Ephesus were situated at the sea end of the other great trade route across Anatolia; they competed for a time successfully with Smyrna; but after both cities' harbors silted up, Smyrna was without a rival. The Meles River, which flowed by Smyrna, is famous in literature and was worshiped in the valley. A common and consistent tradition connects Homer with the valley of Smyrna and the banks of the Meles; his figure was one of the stock types on coins of Smyrna, one class of which numismatists call "Homerian." The epithet Melesigenes was applied to him; the cave where he was wont to compose his poems was shown near the source of the river; his temple, the Homereum, stood on its banks. The steady equable flow of the Meles, alike in summer and winter, and its short course, beginning and ending near the city, are celebrated by Aristides and Himerius. The stream rises from abundant springs east of the city and flows into the southeast extremity of the gulf. The archaic city ("Old Smyrna") contained a temple of Athena from the 7th century BC. Map of Smyrna and other cities within the Lydian Empire. When the Mermnad kings raised the Lydian power and aggressiveness, Smyrna was one of the first points of attack. Gyges (ca. 687—652 BC) was, however, defeated on the banks of the Hermus, the situation of the battlefield showing that the power of Smyrna extended far to the east. A strong fortress was built probably by the Smyrnaean Ionians to command the valley of Nymphi, the ruins of which are still imposing, on a hill in the pass between Smyrna and Nymphi. According to Theognis (c. 500 BC), it was pride that destroyed Smyrna. Mimnermus laments the degeneracy of the citizens of his day, who could no longer stem the Lydian advance. Finally, Alyattes (609—560 BC) conquered the city and sacked it, and though Smyrna did not cease to exist, the Greek life and political unity were destroyed, and the polis was reorganized on the village system. Smyrna is mentioned in a fragment of Pindar and in an inscription of 388 BC, but its greatness was past. Alexander the Great conceived the idea of restoring the Greek city in a scheme that was, according to Strabo, actually carried out under Antigonus (316—301 BC) and Lysimachus (301 BC—281 BC), who enlarged and fortified the city. The ruined acropolis of the ancient city, the "crown of Smyrna", had been on a steep peak about 380 metres (1,250 ft) high, which overhangs the northeast extremity of the gulf. Modern İzmir was constructed atop the later Hellenistic city, partly on the slopes of a rounded hill the Greeks called Pagos near the southeast end of the gulf, and partly on the low ground between the hill and the sea. The beauty of the Hellenistic city, clustering on the low ground and rising tier over tier on the hillside, was frequently praised by the ancients and is celebrated on its coins. Smyrna is shut in on the west by a hill now called Deirmen Tepe, with the ruins of a temple on the summit. The walls of Lysimachus crossed the summit of this hill, and the acropolis occupied the top of Pagus. Between the two the road from Ephesus entered the city by the Ephesian gate, near which was a gymnasium. Closer to the acropolis the outline of the stadium is still visible, and the theatre was situated on the north slopes of Pagus. Smyrna possessed two harbours. The outer harbour was simply the open roadstead of the gulf, and the inner was a small basin with a narrow entrance partially filled up by Tamerlane in 1402 AD. The streets were broad, well paved and laid out at right angles; many were named after temples: the main street, called the Golden, ran across the city from west to east, beginning probably from the temple of Zeus Akraios on the west slope of Pagus, and running round the lower slopes of Pagus (like a necklace on the statue, to use the favorite terms of Aristides the orator) towards Tepecik outside the city on the east, where probably stood the temple of Cybele, worshipped under the name of Meter Sipylene, the patroness of the city. The name is from the nearby Mount Sipylus, which bounds the valley of the city's backlands. The plain towards the sea was too low to be properly drained, and in rainy weather, the streets of the lower town were deep with mud and water. At the end of the Hellenistic period, in 197 BC, the city suddenly cut its ties with King Eumenes of Pergamum and instead appealed to Rome for help. Because Rome and Smyrna had no ties until then, Smyrna created a cult of Rome to establish a bond, and the cult eventually became widespread through the whole Roman Empire. As of 195 BC, the city of Rome started to be deified, in the cult to the goddess Roma. In this sense, the Smyrneans can be considered as the creators of the goddess Roma. In 133 BC, when the last Attalid king Attalus III died without an heir, his will conferred his entire kingdom, including Smyrna, to the Romans. They organized it into the Roman province of Asia, making Pergamum the capital. Smyrna, however, as a major seaport, became a leading city in the newly constituted province. Map of Western Anatolia showing the "Seven Churches of Asia" and the Greek island of Patmos. As one of the principal cities of Roman Asia, Smyrna vied with Ephesus and Pergamum for the title "First City of Asia." A Christian church and a bishopric existed here from a very early time, probably originating in the considerable Jewish colony. It was one of the seven churches addressed in the Book of Revelation. Saint Ignatius of Antioch visited Smyrna and later wrote letters to its bishop, Polycarp. A mob of Jews and pagans abetted the martyrdom of Polycarp in AD 153. Saint Irenaeus, who heard Polycarp as a boy, was probably a native of Smyrna. Another famous resident of the same period was Aelius Aristides. Asian Jewish Christianity received in turn the knowledge that henceforth the "church" would be open without hesitation to the Jewish influence mediated by Christians, coming not only from the apocalyptic traditions, but also from the synagogue with its practices concerning worship, which led to the appropriation of the Jewish passover observance. Even the observance of the sabbath by Christians appears to have found some favor in Asia...we find that in post-apostolic times, in the period of the formation of ecclesiastical structure, the Jewish Christians in these regions come into prominence. Polycarp also was not only instructed by apostles, and conversed with many who had seen Christ, but was also, by apostles in Asia, appointed bishop of the Church in Smyrna…always taught the things which he had learned from the apostles, and which the Church has handed down, and which alone are true. To these things all the Asiatic Churches testify, as do also those men who have succeeded Polycarp. Anyhow the heresies are at best novelties, and have no continuity with the teaching of Christ. Perhaps some heretics may claim Apostolic antiquity: we reply: Let them publish the origins of their churches and unroll the catalogue of their bishops till now from the Apostles or from some bishop appointed by the Apostles, as the Smyrnaeans count from Polycarp and John, and the Romans from Clement and Peter; let heretics invent something to match this. Hence, apparently the church in Smyrna was one of the churches that Tertullian felt had real apostolic succession. During the mid-3rd century, most became affiliated with the Greco-Roman churches. When Constantinople became the seat of government, the trade between Anatolia and the West diminished in importance, and Smyrna declined. The Seljuk commander Tzachas seized Smyrna in 1084 and used it as a base for naval raids, but the city was recovered by the general John Doukas. The city was several times ravaged by the Turks, and had become quite ruinous when the Nicaean emperor John III Doukas Vatatzes rebuilt it about 1222. In the year 1403, Timur had decisively defeated the Knights Hospitaller at Smyrna, and therefore referred to himself as a Ghazi. Ibn Batuta found it still in great part a ruin when the homonymous chieftain of the Beylik of Aydın had conquered it about 1330 and made his son, Umur, governor. It became the port of the emirate. During the Smyrniote Crusade in 1344, on October 28, the combined forces of the Knights Hospitaliers of Rhodes, the Republic of Venice, the Papal States and the Kingdom of Cyprus, captured both the harbor and city from the Turks, which they held for nearly 60 years; the citadel fell in 1348, with the death of the governor Umur Baha ad-Din Ghazi. In 1402, Tamerlane stormed the town and massacred almost all the inhabitants. The Mongol conquest was only temporary, but Smyrna was recovered by the Turks under the Aydın dynasty after which it became Ottoman, when the Ottomans took over the lands of Aydın after 1425. During the late 19th and early 20th century, the city was an important financial and cultural center of the Greek world. [citation needed] Out of the 391 factories 322 belonged to local Greeks, while 3 out of the 9 banks were backed by Greek capital. Education was also dominated by the local Greek communities with 67 male and 4 female schools in total. The Ottomans continued to control the area, with the exception of the 1919–1922 period, when the city was assigned to Greece by the Treaty of Sèvres. The most important Greek educational institution of the region was the Evangelical School that operated from 1733 to 1922. Greek troops marching on İzmir's coastal street, May 1919. The occupation of Smyrna came to an end when the Turkish army of Kemal Atatürk entered the city on September 9, 1922, at the end of the Greco-Turkish War (1919–1922). In the immediate aftermath, a fire broke out in the Greek and Armenian quarters of the city on September 13, 1922, known as the Great Fire of Smyrna. The death toll is estimated to range from 10,000 to 100,000. The remains of the ancient agora of Smyrna constitute today the space of İzmir Agora Museum in İzmir's Namazgah quarter, although its area is commonly referred to as "Agora" by the city's inhabitants. Engraving with a view of the site of Smyrna Agora a few years after the first explorations (1843). New excavations in the agora began in 1996. They have continued since 2002 under the sponsorship of the Metropolitan Municipality of İzmir. A primary school adjacent to the agora that had burned in 1980 was not reconstructed. Instead, its space was incorporated into the historical site. The area of the agora was increased to 16,590 square metres (178,600 sq ft). This permitted the evacuation of a previously unexplored zone. The archaeologists and the local authorities, means permitting, are also keenly eyeing a neighbouring multi-storey car park, which is known to cover an important part of the ancient settlement. [citation needed] During the present renovations the old restorations in concrete are gradually being replaced by marble. In the early 20th-century, there were mills spinning thread. As of 1920, there were two factories in Smyrna dyeing yarn, which were owned by British companies. These companies employed over 60,000 people. During this time, there was also a French owned cotton spinning mill. The city also produced soap made of refuse olive oil. An ironworks, also owned by the British, produced tools and equipment. Those tools were used to extract tannin from valonia oak. As of 1920, the ironwork was exporting 5,000 tons of product a year. The city also produced wooden boxes, which were used for fig and raisin storage. The wood for the boxes was imported from Austria and Romania. Several American cities have been named after Smyrna, including Smyrna, Georgia; Smyrna, Tennessee; Smyrna, Delaware; Smyrna, Michigan; Smyrna, Maine and New Smyrna Beach, Florida. ^ Weston, J. (2007). Patmos Speaks Today. Scripture Truth Publications. p. 27. ISBN 9780901860668. Retrieved October 10, 2014. ^ Gates, Charles. Ancient Cities: The Archaeology of Urban Life in the Ancient Near East and Egypt, Greece, and Rome. ^ Strabo xiv. (633 BC); Stephanus Byzantinicus; Pliny, Natural History v.31. ^ Tertullian. Liber de praescriptione haereticorum, circa 208 A.D.
^ Stetton, The Papacy and the Levant, vol. 1, 1976. ^ A Modern Crusade in the Turkish Empire. Retrieved June 10, 2008. ^ Geōrgiadou, Maria (2004). Constantin Carathéodory: mathematics and politics in turbulent times. Springer. p. 145. ISBN 978-3-540-20352-0. ^ Andrew Mango, Atatürk, p. 217. ^ Naimark, Norman M. Fires of Hatred: Ethnic Cleansing in Twentieth-Century Europe. Cambridge: MA: Harvard University Press, 2002, p. 52. ^ Rudolph J. Rummel, Irving Louis Horowitz (1994). "Turkey's Genocidal Purges". Death by Government. Transaction Publishers. ISBN 978-1-56000-927-6. , p. 233. ^ Naimark. Fires of Hatred, pp. 47-52. ^ Prothero, G.W. (1920). Anatolia. London: H.M. Stationery Office. p. 111. ^ Prothero, G.W. (1920). Anatolia. London: H.M. Stationery Office. p. 112. ^ "Google maps". google.com. Retrieved August 16, 2015. Ekrem Akurgal (2002). Ancient Civilisations and Ruins of Turkey. Kegan Paul. ISBN 978-0-7103-0776-7. Stillman, ed. The Princeton Encyclopedia of Classical Sites, 1976. Turner, J. Grove Dictionary of Art. Oxford University Press, USA; New Ed edition (January 2, 1996); ISBN 978-0-19-517068-9. Milton, Giles (2009). Paradise Lost. Sceptre. ISBN 978-0-340-83787-0. Wikimedia Commons has media related to Agora of Izmir.